An essential reading for parents, teachers, and your inner self who is so eager to show you what you can do. Much of what we think of the personality actually grows out of the mindset. If you believe that how much you work, you will never exceed your abilities, then you have a fixed mindset. If you believe there is no innate talent, that abilities can be developed, then you have a growth mindset. And just by knowing about the two mindsets, you can start thinking and reacting in new ways. 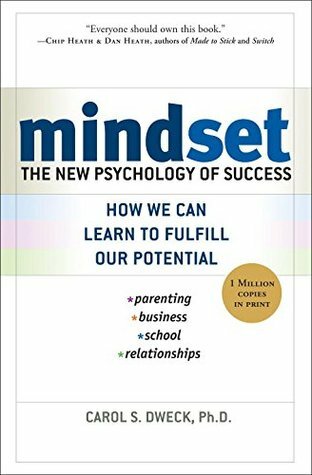 By reading Mindset, you will understand the greats - in the science, arts, sports, and business. You will see how the mindset is key to unleash your potential, and that of your children. Each chapter is filled with numerous stories both ripped from the headlines and based on author own life and experiences. The author, Carol S. Dweck, is Professor of Psychology at Stanford University, and is used to academic work. But the style of the book is very engaging. It is as if she is talking directly to you, be you inclined to overestimate talent (the main audience of this book) or simply trying to better understand who you are. Mindset reinforced my satisfaction of never being satisfied of my work. It help me communicate about this trait of my personality. A welcome complement to other books such as Grit and Peak.